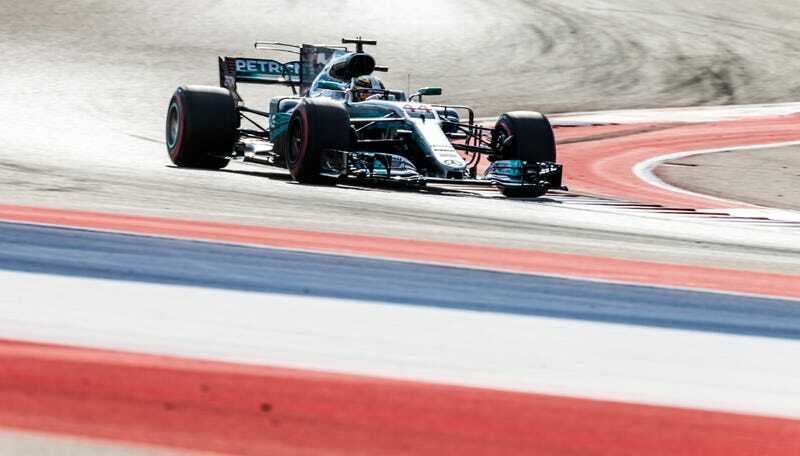 Mercedes driver Lewis Hamilton dominantly won the United States Grand Prix at Circuit of The Americas on Sunday, but Ferrari’s Sebastian Vettel clawed his way back up to second in the finishing order to keep Hamilton from clinching the Formula One World Drivers’ Championship. Hamilton, while the dominant force of the day, wasn’t the wildest story to come out of the race. (Hamilton dominating is pretty normal.) Red Bull Racing’s Max Verstappen qualified sixth and started 17th due to a grid penalty, but clawed his way up to a podium finish with a last-lap pass over Ferrari’s Kimi Raikkonen. The podium was then taken away from Verstappen, as race stewards gave him a 5-second penalty for “leaving the track and gaining an advantage.” Raikkonen got moved back up to third. Verstappen, who just signed on to stay with Red Bull through 2020, was up to sixth just 10 laps into the race with a pass over Force India driver Esteban Ocon. By lap 56, he’d run up on Mercedes’ Valtteri Bottas for fourth, and took the spot after the two drivers fought for it through several turns. That’s when he opened himself up for a podium, and got it—kind of—with a few turns to go. But back to that title battle. Going into the 56-lap race, Hamilton had a chance to clinch the title: If he won and Vettel finished sixth or lower, it was his. If Hamilton got second, Vettel finished ninth or lower and Bottas finished third or lower, it was also his. Hamilton won, but the rest didn’t work out for him. Hamilton started first with a record-destroying qualifying run, but Vettel took off on the start and beat him through COTA’s infamous first corner. A few laps in, Hamilton said over the team radio that his pace felt good and his teammate, Bottas, ran in third behind him. Bottas and Red Bull’s Daniel Ricciardo smacked each other around a few times for fourth on lap four, all while Hamilton was closing in on Vettel. Hamilton passed Vettel for the lead on the sixth lap, and ran away with it from that point forward. Vettel fought for the spot back briefly, but began dropping like a rock soon afterward. He was already 2.2 seconds back by lap 10, and a full 5 seconds back by lap 16. Vettel hung around 4.5 to 6 seconds behind Hamilton in second for most of the race, but what took everyone else out of contention was Hamilton’s pit strategy. Vettel, Verstappen and Bottas made two stops while Hamilton and Raikkonen took only one, leading Hamilton to win by nearly 10.2 seconds over Vettel. Raikkonen finished third after the penalty, Verstappen fourth and Bottas fifth. Also of note, Ricciardo pulled off on lap 16 with engine issues. Parked off of the track near turn 15, he radioed that the “engine has gone.” McLaren-Honda’s Fernando Alonso began to slow down on lap 25, letting his engine get the best of him as well. That was not surprising. And, while it didn’t drop him too far from where he was running anyway, Haas F1 driver Kevin Magnussen spun on lap 47 and got going again in 15th position, finishing 16th a few laps later. After the race, the driver’s championship looks like this: Hamilton has 331 points, Vettel 265 and Bottas 244. The drop-off is steep afterward. While Hamilton has to wait a little longer to try to clinch the title again, Mercedes clinched the constructor championship for 2017.